Trading cryptocurrency for some people it’s like offering them a book in a language they can’t read and asking them to read. It looks complicated and dangerous. But it’s not as hard as it looks if you’re willing to spend a little time and effort on learning the basics. As you probably know the aim of trading is to make profit by buying something at one price and selling it at a higher price. In reality there are more ways of making a profit even in a down market but let’s not go into that and keep it simple. Basically you want to buy low and sell high, right? Most inexperienced traders look at a chart see the line going up or down and jump right in to buy, then wait to see the line of the graph go higher to sell. Some just buy after something has been going down for days in the hope it will go up again. And others just blindly follow pumps and advice from others. If you trade like this you might as well go to a casino, the result will be the same, loss of money. So how do you determine when something is ripe for the buying or selling? As a trader we do not necessarily treat cryptocurrency the way an investor would. Investors typically look at the intrinsic long term value of a coin or token. Traders typically move in an out of coins and don’t care as much about the value of the coin they are trading as investors do. Instead of looking at the underlying value traders tend to look more at patterns that occur on charts. What drives the market is mostly speculation, greed and news especially in crypto where the value of the coins are not always as clear yet as the value shares from established companies. These behaviors tend to follow patterns and by analyzing those we can predict with a higher degree of accuracy (than pure gambling) which way the trend will go. This increases our odds of doing a good trade. This is were some Technical Analysis comes in handy. Because the aim of this article is to help beginners we will limit us to some of the most important and basic indicators. Now if you didn’t understand the definition don’t worry basically it’s an indicator that tells you whether there has been too much selling going on or too much buying to sustain a trend which means it usually reverses at that point. In the graph above we have the price of the coin/stock (black graph) and at the bottom (blue graph) we have the RSI. 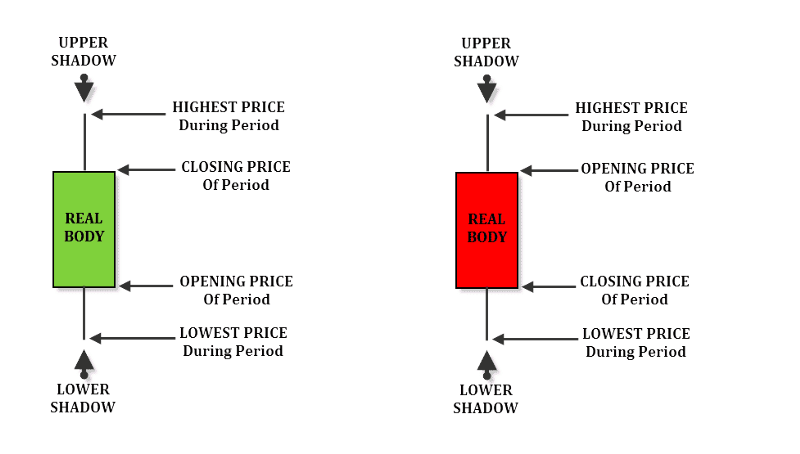 As you can see it has a scale from 0–100 with two horizontal lines at 30 en 70. 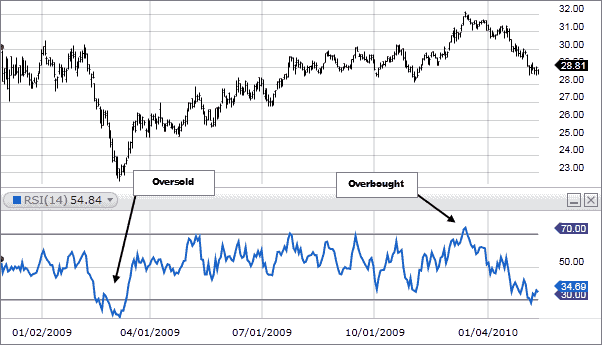 Those lines indicate the points were we enter overbought en oversold areas. So when we break through 30 going downwards we end up in oversold area, that usually indicates reversal to an upward trend. And we can see the coin/stock chart (black graph) go up again. Same for values above 70 they indicate a reversal but this time in the opposite direction. Basically what this does is average out the ups and downs on the chart so that the trend is clearly visible without the “noise”. Plotted is the 50-day moving average because it’s based on prices going back 50 days it lags compared to the current price. Short time MAs are used for short-term trading, longer MAs for long term investing. Most commonly used are the 50 and 200 days MAs. There are also some other variants like the EMA (exponential moving average which tend to put more weight on the recent prices). It’s a handy indicator to show us the trend even when prices jumps up and down. When a short-term moving average (blue line 15 MA) crosses above a longer-term moving average (red line 50MA) we have upward momentum, when the opposite happens we have downward momentum. A death cross occurs when the 50-day simple moving average crosses below the 200-day moving average. This is considered a bearish signal, indicating that further losses are in store. The golden cross occurs when a short-term moving average breaks above a long-term moving average this is a bullish signal. (Bullish means positive and bearish negative). As you can see whenever the blue line crosses and comes on top it’s a sign for an uptrend while when the opposite happens it indicates a downward movement. You can see on the chart that it corresponds well with the movement of the price of the coin. Used in combination with RSI it can help you enter and exit the market better. As you can see from the chart above during the uptrend there have been red candles and you might have sold giving in to your emotions but the MACD gave no indication of a crossover and if the RSI confirms then you wouldn’t have sold at that time but just after it peaked when the crossover occurred. Selling right at the top is hard but you can make a good exit knowing your indicators. Bollinger bands (green bands/lines) indicate a change in volatility and usually when that occurs something is about to happen. If these green bands contract it means volatility goes down and renewed movement may send it up or down thereby expanding the Bollinger bands again. However Bollinger band squeezes do not indicate trend nor are they 100% reliable as signal, they have to be used in combination with other indicators. When price stays close to the upper Bollinger bands however it’s a rather bullish sign, but also mean we need to keep close watch for changes. Candle sticks basically pack a lot of information into a small candle-like image so you can see at a glance what is happening. It contains the highest price of the day, the upper wick (or shadow), the lowest price of the day the lower wick (or shadow) and opening & closing price. Depending on whether it closed higher than the opening or not it will be a either green (or white) or red (or black). If it closes higher than the opening then it’s green otherwise it’s red. We can have candles for short or long periods of time from 1 minute time frames to 1 day candles to even 1 month candles. The longer the period the more reliable the conclusions you can draw from the candle shape/color. 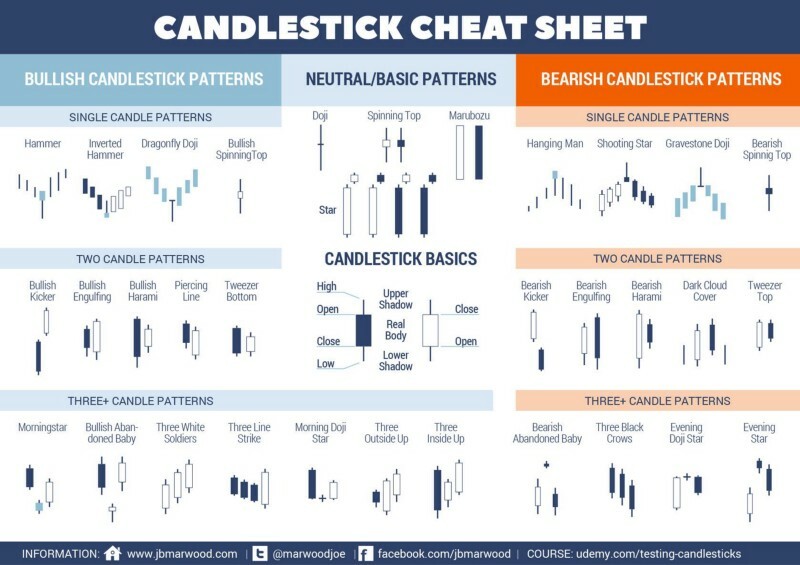 Above are some of the most common candlestick patterns. If you see these occur they can help you identify which way the market is going to go. Of course it also depends on the time-frame you’re checking usually the longer the time frame the more reliable these signals become. Now now that we have learned a few of the basic technical analysis methods (the hardest part), what tools do we use to do this type of analysis. One site I can recommend is Tradingview. It offers limited functionality charting for free which allows you to set a maximum of 3 technical indicators on any given chart. That’s good to start with and we do recommend to go straight for the 30 day trial though so you have full functionality right from the beginning. You can always go back to the free version after 30 days if you find you don’t need to the pro version. It’s good to start with full functionality so you can add all the different indicators on 1 chart, that will help you to get familiar with all and you can instantly see if the different indicators align or not. You can also open multiple charts at once and keep track of all your coins at once. You can have already have a pro plan for $9.95 US /mo which is not much if you consider how much losses it will save you and how much profit it will return each time you make a more informed buy or sell. It’s a tool you need. A very worthwhile investment. People: members you wish to follow. What matters here for you is Ticker and Trading Ideas. Ticker because it provides access to the actual charts and Trading Ideas so you can look at ideas proposed by other members. You can see lots of results for different exchanges, the ones mentioned are also the most used exchanges. I’m gonna focus on Binance for the rest of the tutorial because it has become one of my favorite exchanges. But before we discuss this trading platform let’s have a look at Trading View itself. 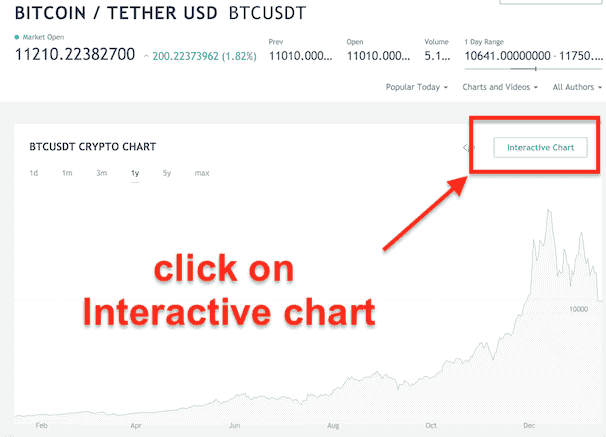 Start by clicking on the Interactive Chart button. This will give you a chart like the one below. From the top toolbar click on the Candles icon and choose Candles as the default chart type. Next click on the button left of the candles icon to set the timeframe. Here you choose the timeframe you want to do your analysis on. Short timeframes are good if you have a lot of money and can gain from a small percentage of gain. I usually look at 30 minutes, 4 hours or 8 hours & a day. The larger the timeframe the more reliable your pattern becomes as it’s made up of a larger set of data that averages out any irregularities and glitches. For beginners it’s probably best to look at larger timeframes and do longer term trades. To add technical analysis indicators on your chart click on the indicators button on the top toolbar, next type RSI in the popup window and click on Relative Strength Index. You have just added an RSI indicator to your chart. You can do the same for MACD or any other indicator. Just remember on the free version you are limited to max 3 indicators. Tradingview has many more options but it would lead us too far to go into further detail, you could check YouTube for some introductory videos. Let us move on to the trading platform itself. We have picked Binance as example for various reasons. We used to use Bittrex and after that Kucoin but I find myself using Binance more and more. Bittrex is too bare bones, it hasn’t got a mobile app which I find unacceptable in 2018 and it has this weird “the IP address has changed bug” (when it hasn’t) which makes logging in tedious for me. The major reason Bittrex is popular is that they have a large selection of alt-coins listed and a decent volume. Their API (application programming interface) also makes it possible for bots and all kind of apps to interact with it, which also explains why it’s so popular. Of course there’s Kraken, Poloniex, Bitfinex, Bitstamp and so on. I haven’t tried them all so feel free to pick what suits you best. So why pick Binance? Well Binance has clearly a lot of traction, it reached 6 million customers in record time. Kucoin which basically copied Binance reached 2 million even faster. Are they perfect? No, certainly not I miss functionality like ability to short, set trailing stops. Without going into detail what these are, it’s a beginners tutorial after all, it makes trading crypto a little harder in the sense that you can’t automate your trading as much. Things we like about Binance, is that it works as intended, its user interface is well thought out and easy to understand which makes it good for beginners. It has over 6 million users, has a high volume, good amount of coins, fast site & good stable fast app, reasonable customer support, they hold contests & have cheap transaction and withdrawal fees. If you have any BNB, they will use BNB to pay for transaction fees as default. A 50% discount will be applied, if you use BNB for transaction fees, which is 0.05%. 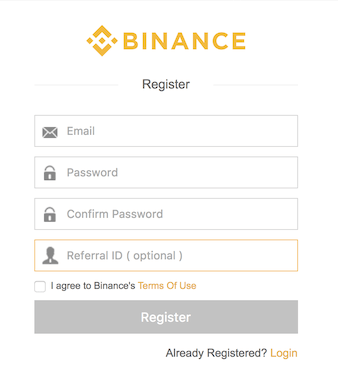 Registering at Binance is basically similar to any other registration, you have to provide your email, pick a password and like most online businesses in a growth phase they have a referral program to incentivize people to try out their services. It’s optional and it’s entirely up to you whether you want to credit the person that referred you or not and won’t affect your usage of the site at all. If you want to credit me for this tutorial you can use my ref id. (16787228). Once you went through the signup process you can login using your email and password. 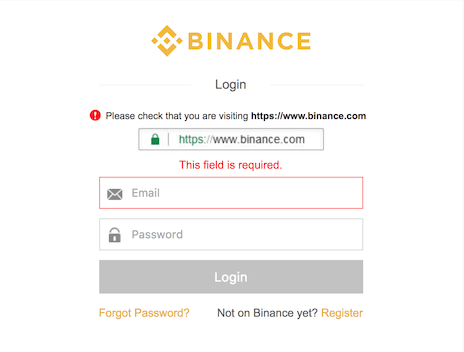 One thing I like is that Binance warns you to check if you’re on their site and that it’s their URL in your browser window, this helps prevent Phishing attempts. What most sites do nowadays is also add a captcha (method to check if you’re human and not a bot). 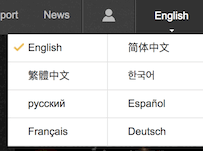 Most of the sites use Google’s implementation which is annoying as hell. 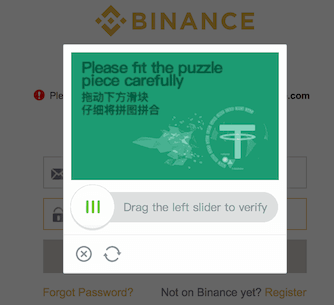 Binance opted for something less annoying but still annoying, safety comes at a cost unfortunately. You have to drag the slider, you’ll notice a puzzle piece that appears and you have to drag it until it fits into the cut out hole. 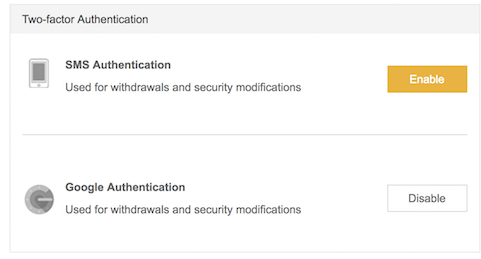 Of course you can also enable Google Authentication to make it more secure. Google authentication basically adds another layer of security by requiring a generated one-time code that can only come from your mobile device. But if you prefer receiving an SMS code that’s also possible. You’ll find these settings in your account. And you can enable or disable these settings so it fits your requirements best. On their front page you’ll see some of the most traded coins of the moment listed and below it the different markets which is basically another name for coin pairs. They currently support BNB (which is their own coin), BTC, ETH and USDT to trade against. 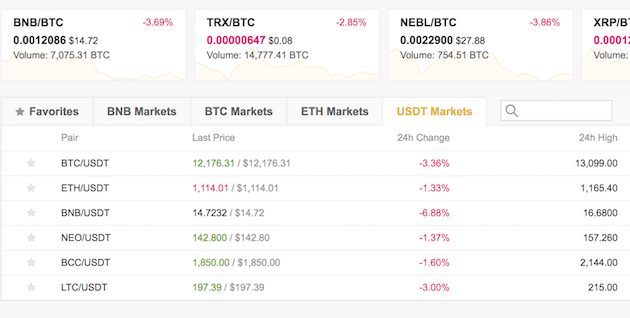 There’s also a search option (magnifying glass next to USDT Markets) that allows you to find a specific coin fast. 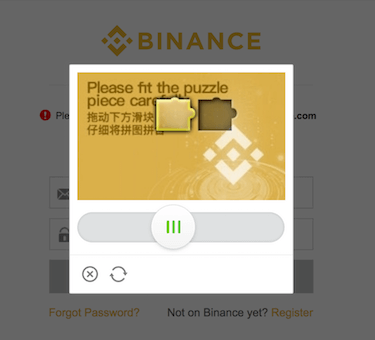 If you already have coins you most likely know how to transfer them and you can jump right in and deposit them into your account at Binance. You’ll be presented with a list of coins to choose from. (under the “Funds” tab). Let’s say we pick BTC. 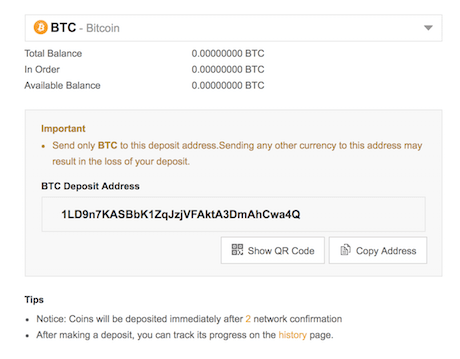 We will be greeted with a page that provides us with a BTC Deposit Address. This is where you need to send the funds to. 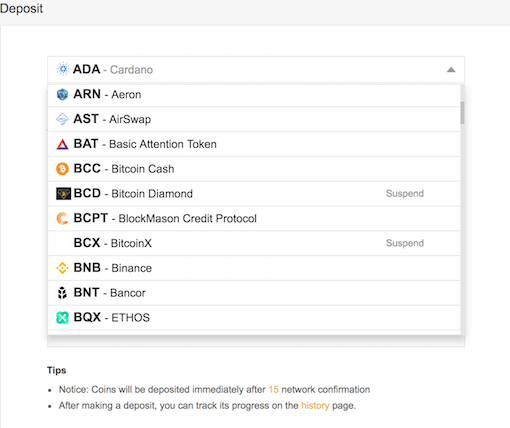 Note every coin has it own address so make sure you’re on the right page. So what you do is enter that address as recipient in Coinbase (Under the accounts tab) or wherever your BTC wallet is. If you don’t have any cryptocurrency yet you need to buy it first at a site that exchanges cryptocurrencies for FIAT money. 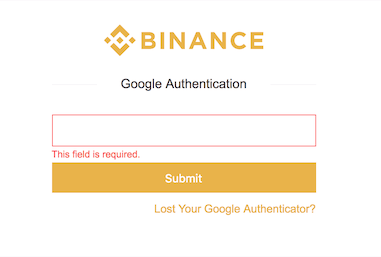 Because Binance doesn’t accept FIAT money yet. At the top left you see this z-like icon followed by the word “Exchange”, this is where you click to start trading. You have the option to choose between Basic and Advanced which is little misleading as Basic is just their old layout and Advanced their new layout. Advanced is so much better that we will just skip Basic altogether. The trading interface might be a little intimidating at first but if you have used Tradingview at least the graph part looks familiar. Top left we have the chart, bottom left there is the overview of the open orders, order history and trade history. At the top right we see the asks, bids and list of orders. 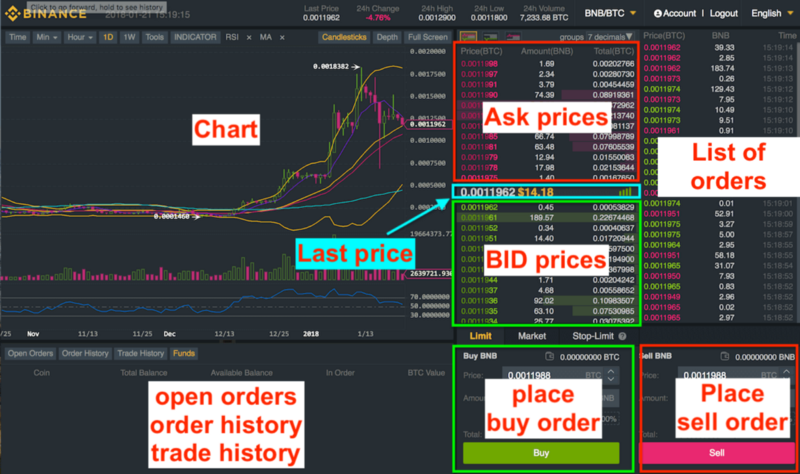 The asks are basically the prices the sellers ask us to pay, the bids are the prices the buyers want to pay and in between we can find the last price at which a sell/buy occurred. The list of orders is a chronological list all orders. To place an order we use the small form which I labelled “place buy order”, to sell we use the form which I labelled “Place sell order”. The Limit tab, is to place limit orders. Limit orders are orders limited by the price you set. Market orders (next tab) are orders where you don’t set a price but buy at the current market rate. This allows the order to go through nearly instantly as you buy at the current asking price. I advice to always use a limit order you need to know what you’re doing and what price you are getting anyway. Stop-limit is similar to the limit tab except it is conditional, the order is only executed when a certain condition is reached. You can instruct to send a limit order only when it hits a certain price for example. Since this is a more advanced use, I will not go into further detail here it would only confuse beginners. In the form you can see “Price”, obviously that’s where you enter the price you are prepared to pay to acquire the coin you’re after. Since we are trading in this example BNB for BTC the price is expressed in BTC (and NOT in USD or EURO). 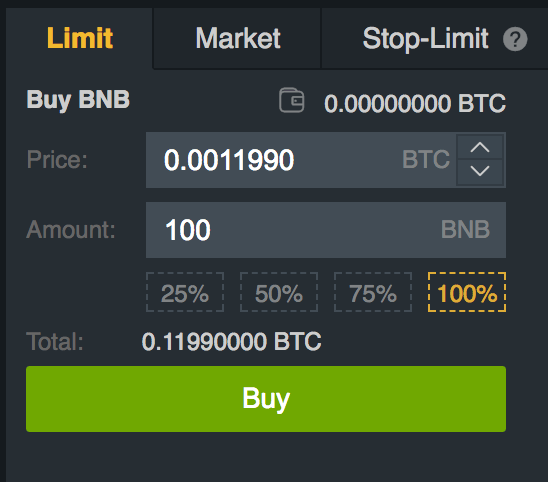 “Amount” is the amount of BNB you want to buy and “Total” is the total price you’ll have to pay. It’s easy to make mistakes typing the price, so just click on any of the orders in the bids or asks and you’ll notice that price will appear in the price dialogue. The 25% 50% 75% 100% below allows you to allocate respectively 25% to 100% of your BTC. If you want to sell again you’ll do the same except you’ll be using the Sell form this time. On the chart you’ll see a familiar interface, that resembles that of Tradingview albeit more simple where you can set indicators, timeframes. Your gifts keep this site going!